Psoriasis is a chronic inflammatory skin condition that is caused in part by an overactive immune system. This signals the body to grow skin cells 4 to 5 times faster than normal. Instead of the normal shedding process, these skin cells pile up on the surface and form red or silver patches called plaques. Plaque Psoriasis is the most common form of psoriasis as 90% of patients suffer from it. This type of psoriasis appears like islands on the skin with redness and scale. It is most commonly seen on the elbows, knees, lower back and scalp. Erythrodermic Psoriasis is the most harmful to the patient. This appears as bright red skin usually over 60% or more of the body. The patient will often experience a fever and the chills. Erythrodermic psoriasis should be treated immediately by a doctor and could be a medical emergency. Guttate Psoriasis appears as little droplet sized patches most commonly found on the chest/back/arms/legs. Guttate psoriasis is often brought on by an acute bacterial infection such as strep throat. Inverse Psoriasis usually occurs in the folds of the skin such as the under arms, in the groin and under the breasts. Inverse psoriasis appears as flat red patches, often very painful and accompanied by yeast. Pustular Psoriasis looks like little blisters filled with sterile fluid. It is often misdiagnosed and is the hardest to treat. Pustular psoriasis commonly appears on the palms and soles of the feet. Because of the location, many times this form of Psoriasis can be disabling. Psoriatic Arthritis is a chronic disease characterized by inflammation in the joints which causes pain and swelling. Changes in the joints may range from mild to severe and dramatically affect the individual’s ability to perform activities of daily living. The joint changes can be permanent if not identified and treated. Only patients with psoriasis can develop psoriatic arthritis. A small number of individual’s, ten percent, may develop joint symptoms prior to skin symptoms. Disease flares may alternate with periods of remission with psoriatic arthritis as well as psoriasis. Evaluation should be done by an experienced Dermatologist who specializes in psoriasis. Topical Therapy is the most frequently used treatment by doctors today. There are two types of topical treatments that can be used for psoriasis; steroidal creams and non-steroidal creams. Topical steroids contain synthetic cortisone which is an anti-inflammatory agent to reduce redness and swelling. Patients using topical steroids should follow doctors’ instructions closely to prevent thinning of the skin, easy bruising and stretch marks.Examples of non-steroidal medications are tar, salicylic acid, topical retinoids and vitamin D analogs. Tar can be bought over the counter and is used to help slow rapid skin cell growth, and help reduce itching and scaling. Like tar, salicylic acid can be purchased over the counter and is used to shed scale. Both tar and salicylic acid can be prescribed as compounds combined with other topical therapies. Topical retinoids and Vitamin D products are prescribed by a physician. These agents help to remove scale and flatten the psoriatic lesions. Topicals come in cream, ointment, lotion, solution, gel, foam and spray. Ointments are prescribed more frequently since they are more occlusive and tend to work better. Lotion, foam and solution may be used on the scalp allowing for easy application. Light treatments work by penetrating the skin to slow the rapid skin cell growth. 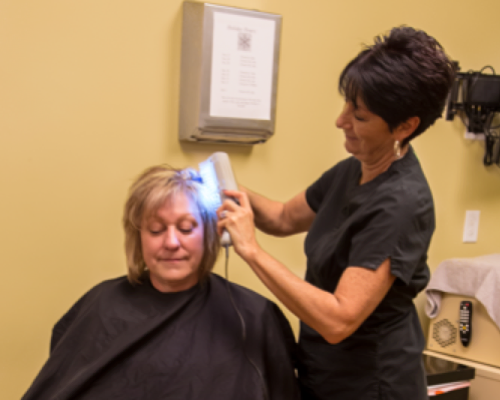 Light treatments are most commonly administered in the physician’s office however, in some special cases, it is possible for the doctor to prescribe a light unit for home use. UVB is the most common light used. The most common side effects include a sunburn type reaction, slight increased risk of skin cancer and increased dryness and itching. There are two forms of UVB lights used to treat psoriasis, broadband (BB) UVB and narrowband (NB) UVB. Our center uses narrow band UVB. Broadband UVB was the first type of light therapy used to treat skin diseases. Broadband UVB is composed of the wavelengths 290-320 nanometers. Shorter treatment times are administered to help avoid obtaining a sunburn type reaction. With this type of treatment, patients experience shorter remission times. 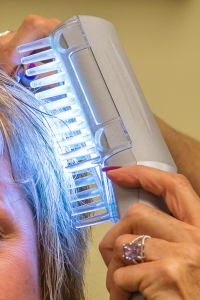 Narrowband UVB is the newest form of UVB light therapy. Narrowband UVB is composed of the wavelengths 311-312 nanometers. At present, this type of light treatment is used most frequently. Patients experience longer remission times and experience less of a sunburn type reaction than that experienced in the BB UVB light units. Another form of phototherapy is PUVA, a combination of Oxsoralen capsules and UVA light. Unlike UVB light therapy, PUVA requires more diligence in coordinating time the medication is taken with the time of treatment. Treatments must be administered after 90 minutes of taking the prescribed amount of Oxsoralen. Although this type of light therapy is the most effective, it is not commonly used. Patients may experience multiple side effects from the medication such as nausea, vomiting, dizziness, headaches, burning, itching, and photosensitivity, often causing them to seek other types of treatment. Since PUVA penetrates the skin deeper than UVB light, there is an increased risk of developing invasive skin cancer. 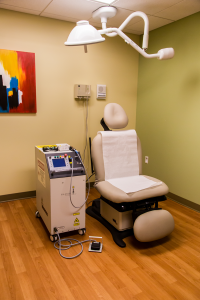 The Pharos excimer laser treats patients with stable plaque psoriasis involving less than 10% body surface. It treats the affected area with a concentrated laser that delivers NB UVB light. 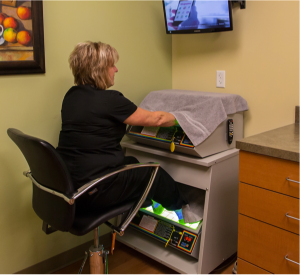 The unit is similar to the NB UVB booth however the laser allows us to deliver higher doses to specific localized areas. Side effects include possible sunburn type reaction, increased pigmentation, dryness and itching. With persistent psoriasis, when topicals and/or light therapy are no longer effective, an oral medication is often prescribed. This type of therapy requires a commitment from the patient, including scheduled lab work and frequent office visits. Oral medications frequently show the highest success rate in improving psoriasis. The oral medications most commonly used in this office are Methotrexate and Acitretin, commonly known as Soriatane. Approved for treatment of psoriasis in the 70’s, Methotrexate is one of the oldest most successful forms of treatment still being used today. Methotrexate works by affecting the immune system. It prevents the rapid turnover of skin cells seen in psoriasis. This drug is taken once weekly. Patients with renal, hepatic or hematological abnormalities or with a history of alcohol abuse are advised not to use Methotrexate. Since it is filtered through the liver, a liver biopsy is frequently taken after patient’s overall intake exceeds a total of 3 grams. Although Methotrexate is often used with patients who continue to come for light therapy, it is not recommended they receive treatments for 48-72 hours after taking the drug. The physician will also have regular labs drawn to monitor any adverse effects on the body. The most common side effects of Methotrexate are nausea, vomiting, mouth sores and headaches. Patients on Methotrexate often experience photosensitivity so precaution should be used if light therapy is continued. Acitretin is used in several types of psoriasis. It works especially well for the Pustular and Hand/Foot type. Women of child bearing age are advised not to use the drug due to the possibility of having a child with birth defects. Soriatane is safe for long term use in men and women of non-child bearing potential. This drug has no serious interactions with other types of oral medications. It also works extremely well when used in combination with phototherapy. Acitretin is an oral retinoid which is derived from vitamin A. Retinoids work by controlling how the cells multiply, including how fast skin cells grow and are shed from the skin. Since the drug can affect lipid levels, blood tests to monitor cholesterol and triglycerides are required. In addition, every three years an ankle x-ray or bone density scan may be recommended in patients who are on a long duration of therapy. Common side effects include hair loss, dry skin, peeling of the fingertips and chapped lips. Patients with a history of depression are not advised to take Acitretin. These types of drugs are taken in injection and infusion forms. They are the newest forms of treatment for Psoriasis and Psoriatic Arthritis. This type of therapy is convenient for many patients because it is administered at home. These therapies are often fast acting however as with all therapies there are a few patients who may respond better to one type of treatment or another. These types of therapies also require close monitoring. This includes lab draws, frequent office visits and yearly tests such as tuberculosis screening. Biologics, unlike oral medications which are made by chemicals, are made from proteins. They work by blocking particular immune cells that are overactive in the immune system of patients with psoriasis. Although there are very few side effects to the biologics, the long term effects are still unknown. As more and more of these agents are developed, our approach to effectively treat psoriasis is becoming more targeted. This allows us specifically to target the exact aberrant part of the immune process which leads to psoriasis without affecting the immune system as a whole. 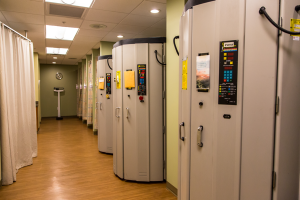 Each patient’s therapy is individualized depending on the type of psoriasis, response to other treatments, and overall health and medical history. Currently there are five biologics approved to treat psoriasis, these include Enbrel, Humira, Remicade, Simponi and Stelera. Let us help with the proper care of your Psoriasis today.